Sometimes changes are difficult to maintain. I have a continuing struggle with paperwork (yes that’s right I am not perfect). Although I know that my life is much better when I am organised and everything is up to date. My mindset chains me to old behaviours, patterns and thoughts. I become stuck. When I was in India I took this photograph of an elephant that was chained. I love elephants. They are a symbol of wisdom and freedom. I felt a certain sadness seeing this majestic creature chained. 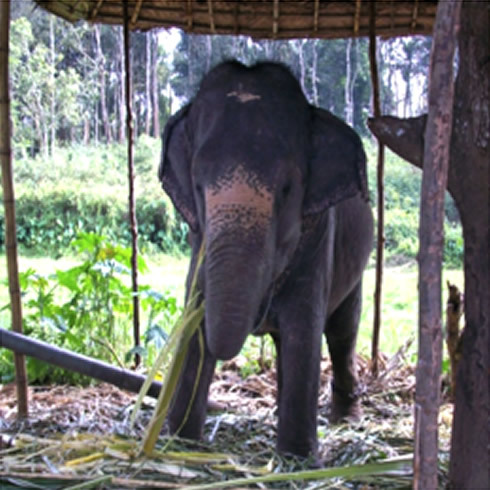 The Mahut explained when elephants are young, they are tethered by a thick rope or chain. They learn that they can’t get free and eventually give up trying. At this point the elephant trainer changes the rope for a thin one, however the elephant makes no attempt to run away. Even when the elephant reaches adulthood, it continues to be tethered by a thin rope, reconciled to its captivity. Elephants are known to be extremely intelligent animals with memories that span many years. They are a symbol of wisdom and yet with all their strength and power when they are tethered they believe they are powerless. They are not dissimilar to humans in this way. We remember experiences and become stuck in the past, believing there is no other possibilities. It is interesting to consider what are you reconciled to believing? What could you change by adopting a different mindset? Some patterns are deeply entrenched. My father didn’t like paperwork. I grew up with the dinning room table covered in papers and it was always stressful for him around tax time or before we went on holidays. I learnt at an early age to associate paperwork with stress and anxiety. I could rationalise and accept the mindset I am my history. “That’s just the way it is.” My rational mind tells me that being disorganised causes me anxiety and I have choices. Awareness is the first step. Awareness allows you examine the evidence and to question Is this mindset belief useful to me? Is this attitude getting me where I want to be? Is it in line with my values? The other question I find revealing. What are the costs of this mindset? I figure if the costs outweigh the benefits it’s time to change. Once you are at this point it is time to work out some new strategies. With my paperwork-I set aside time each day to read, file or flick. I have tried many different strategies and all of them work when I am disciplined and focused. I still need to plan and persist. Maybe one day it will become an habit. Unfortuantely what you resist persists. So when I see the papers piling, breeding and taking on a life of their own. I stop and and remind myself organisation = calm. I go back refocus and start the practice all of over again. I don’t see this as failure. It is just part of the process of maintaining change. I know I am not alone. Please share your comments, thoughts and stories.